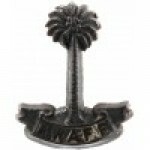 Here are listed some of the British Military Plastic Cap Badges that I have in stock. If you do not see the badge that you are looking for, please fill out the enquiry form. The code numbers refer to King & Kipling book numbers. Plastic badges or more correctly Bakelite, were manufactured mainly by A Stanley & Sons in Walsall West Midlands. During World War 2, as the country was running short of metal for munitions Stanley`s issued these badges as a form of economy.